If you are planning to explore Asia I would definitely recommend to include this 4 days and 3 nights Singapore itinerary. 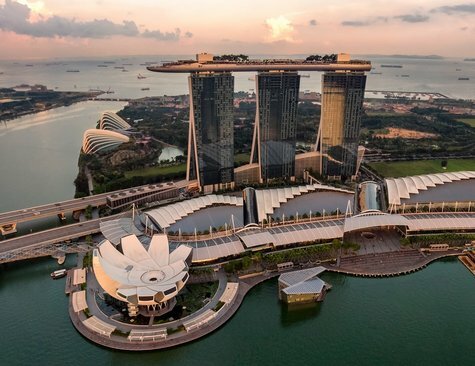 After your first time in Singapore you will understand why this melting pot of cultures is doubtlessly a hit-list destination for every traveler. The vibrant, colourful city is one of 3 city-states in the whole world. It’s also one of the smallest countries with 682.7 square kilometres and 63 additional islands. Because of it’s size it’s very easy to travel around. The national language is Malay but there three more official languages that are used on a daily basis: English, Chinese and Tamil. I love Singapore because it offers numerous modern and unique things to do. Additionally it’s just extremely beautiful. 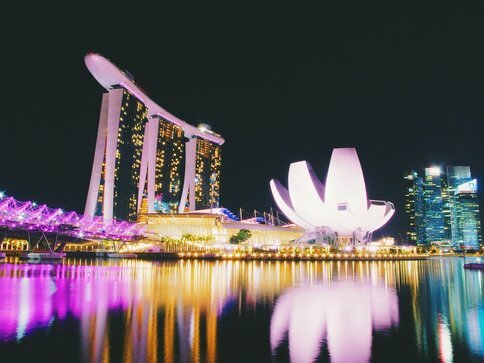 Singapore is not only well-known for being the cleanest and safest city in the world but also for a great and successful mix of Eastern and Western cultures. As a result we can see that a diverse range of architecture, delicious food and entertainment has been created. The name of the country means “Lion”, that’s why it’s probably transformed into an economic powerhouse within recent decades. If you want to enjoy more of beautiful Asia I recommend to fly from Singapore to amazing Kuala Lumpur. Budget travellers can find great deals with Air Asia. The big spenders can enjoy a fancy flight with Singapore Airlines. Singapore has wonderful weather all year around which makes it a perfect travel destination. Nevertheless there is a period from January to February, from June to July and September to October when most of it’s holidays are happening and when it gets very crowded. Singapore is famous for it’s infinity pool at the rooftop of Marina Bay Sands. But if your intention is to swim there and take amazing pictures in the pool then you need to book a room. The view from there is spectacular! If you are planning a budget trip to Singapore then it would be better to stay at areas like Chinatown or Little India. I recommend The InnCrowd Backpackers’ Hostel or The Hive Singapore Hostel. Both of them are very tidy, the staff is friendly and they even offer a lovely breakfast gratis. Singapore has amazing and efficient public transport system which is very easy to understand. 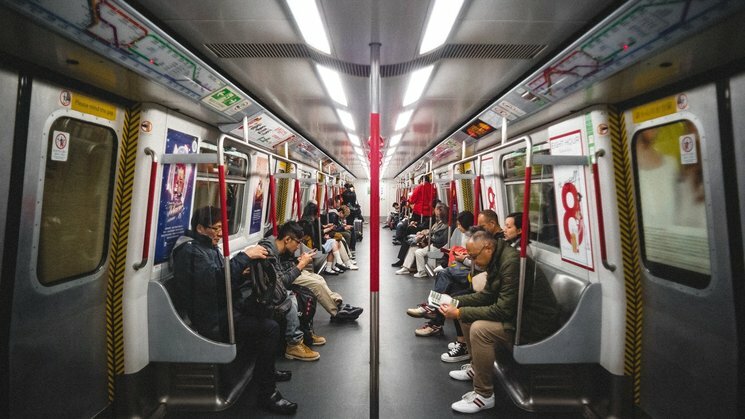 MRT is the most common one because it’s fast and cheap. If you use an EZ-link card you will pay even less and within a few minutes you will reach all main tourist destinations in Singapore. Bus is also a good option to get from A to B, additionally you will get a view of the city while travelling. However if you are not planning to stay very long in Singapore but you still want to see the best of it then Hopper Bus will be the best solution for it. In this case I would suggest to buy the SINGAPORE CITY PASS (2 or 3 days pass) that includes 2 ticket attractions plus hop on and hop off bus. There is also a cheap version of taxi available, Uber. Just remember to download the app. Most travellers arrive in Singapore Changi International Airport. And yes it’s one of the most spectacular and beautiful airports in the world. You can spend a lot of time in it but we need to get to the city. There are three main options to get to your hotel. One of the cheapest is by airport shuttle, which you can buy at the Ground Transport desk in the airport for $9. Within 25 minutes you will be able to check in to your hotel. From Changi Airport you can take MRT to Singapore City. It will take you around 30 minutes to reach the city centre. The cheapest possibility to get to Singapore city is by bus but be prepared to spend 1,5 hours on it. And of course there are airport taxis that will cost you around $20 to get to your destination. Start your day with Singapore’s most popular walk along Marina Bay. It’ the best way to get the first impression of the vivid metropolis. Just follow the Marina Bay Waterfront Promenade around the perimeter of the bay. Visit the iconic Marina Bay Sands and enjoy a drink from the rooftop with an awesome view over the city next to the infinity pool. Another fabulous highlight of Singapore is the Gardens. It’s a 10 minute walk from Bayfront MRT station, it offers the ideal venue for a lovely afternoon in the nature. The Gardens span over 101 hectares and has 3 sectors: Bay South, Bay East and Bay Central. In the evening you will be able to experience the Super Tree Grove light up. The futuristic, gigantic almost 50 metres tall trees glisten and glow in the dark. Interesting fact is that these artificial Supertrees have photovoltaic cells to harvest solar energy during the day so they can light up during the night. 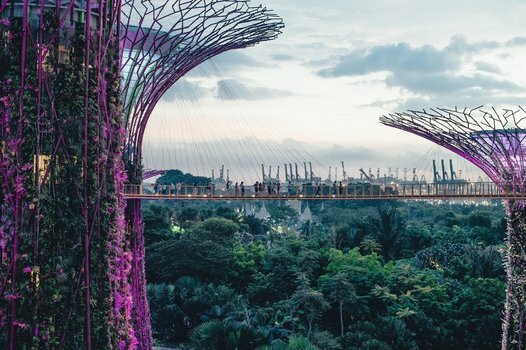 In the Gardens you will also find OCBC skyway, a 128-metre long bridge that connects the Supertrees with the Supertree Grove. In the late evening around 9:30 take a walk to Marina Bay Sands and enjoy spectacular and free entertainment: Spectra – a Light & Water Show. It’s a 13 minute long synchronised show presents Singapore’s story of a multicultural society and cosmopolitan city as we know it today. 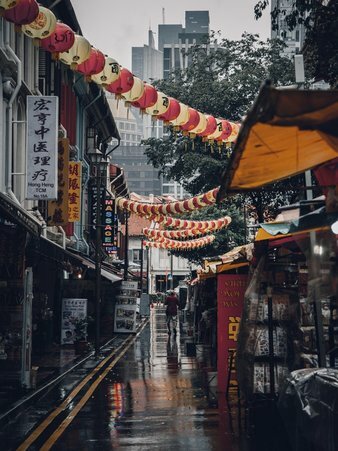 One of the cult places to visit in Singapore in your 4 day journey is Chinatown. It’s a tremendous area where you can immerse into the authentic world of Chinese history and culture. It’s a perfect place to stroll around, buy some souvenirs and try exotic but at the same time delicious food. Don’t forget to visit Sri Mariamman Temple, Thian Hock Keng Temple, Buddha Tooth Relic Temple and Museum, Chinatown Heritage Centre and Hawker Food Center. Afterwards go and visit another cultural district, Little India. I love to explore cities by foot but of course you have always an option to jump on a bus or train. 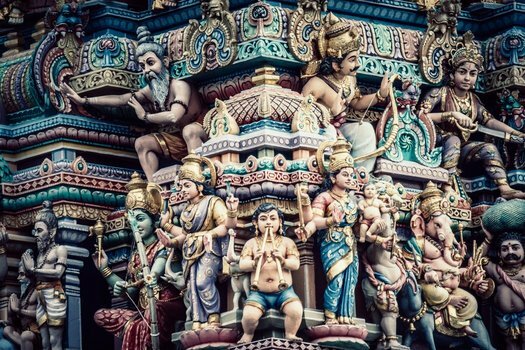 I would recommend to walk to Little India it might take you 45 minutes but you can go through the beautiful Fort Canning Park or visit National Gallery Singapore. If you are a cat lover stop at the cat cafe Café Neko no Niwa. Little India is a small but extremely colourful district in Singapore. There are various temples and Singapore’s famous 24-hour shopping centre – Mustafa Centre. Head to Tekka Centre for Indian cuisine – interesting to try and perfect for the budget travellers. 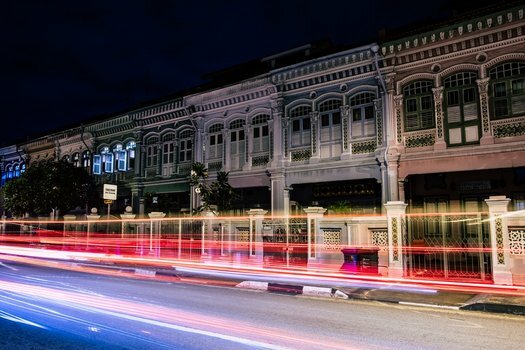 Don’t wait to long and go to the hip neighbourhood of Haji Lane. 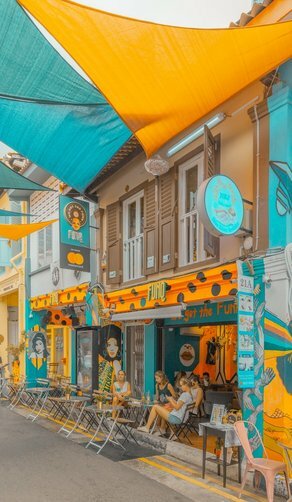 Haji Lane is famous for it’s vibrant street art, cool shops and cafes. There you can also find a fun place, Selfie Coffee. They will print your selfie on your coffee and you can drink it while you are looking at your beautiful self. Furthermore it’s affordable too, coffee prices start at $5. Singapore is a glamorous city which is famous for it’s lights blooming at night. On the first day you could witness the magnificent show at the Bayfront. Now you can visit Clarke Quay and stroll along the Singapore river to watch another glowing wonder. Another great way to spend an evening is to visit the Singapore Night Safari. It’s a unique and exciting way to experience the home to over 1000 different animals. It gives you a great chance to explore the mysterious nightlife of the wildlife and enjoy a wonderful journey. Definitely worth a visit. 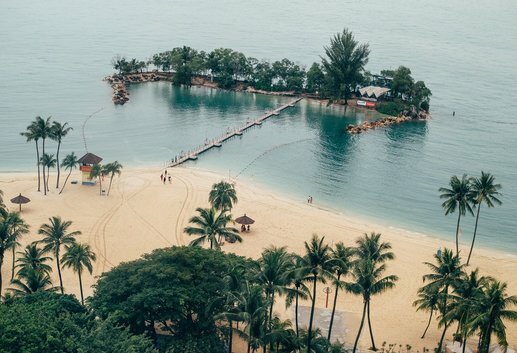 On the third day of this 4-day Singapore itinerary you will discover another unique must-visit attraction, Sentosa. It’s a small island resort which is famous for being called “The State of Fun”. 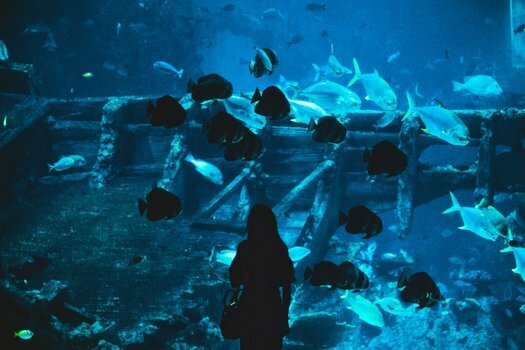 Sentosa is also home to a world class aquarium, beautiful beaches and Universal Studios Singapore. You can purchase Sentosa Fun Passes to bundle various activities and save some money. How to get to Sentosa? Take MRT and get off at Harbour Front Station (North-East Line or Circle Line). From there you can walk to Sentosa via the Sentosa Boardwalk. You can also take a taxi or bus to reach the island. I recommend to take the cable car so you can enjoy the stunning views over the metropolis and it’s harbour front area. Universal Studios in Singapore offers a good time for everyone and it’s one of the top family attractions. It’s a theme park which features movie-themed rollercoasters and numerous attractions. There are 7 different zones: Hollywood, Madagascar, Far Far Away, The Lost World, Ancient Egypt, Sci-Fi City and New York. There you can also find entertaining shows, shops and restaurants. Just 10 minutes away from Universal Studios you will find the famous S.E.A. Aquarium. It’s not only a home for 1.000 underwater species but also a Maritime Experiential Museum. Moreover it is possible to enjoy attractions and visit scenic photography spots which are perfect for an instagram shoot. After 3 long days of walking around this beautiful city it is time to have a relaxing boat ride so you can explore Singapore also from the river’s perspective. Within 40 minutes you will see the best sights and highlights. The tour starts at the following ports: Clarke Quay, Read Bridge, Boat Quay, Fullerton, Merlion Park, Bayfront South and the Esplanade. If you are asking yourself what is another thing you can do in Singapore in 4 days I would say shopping! 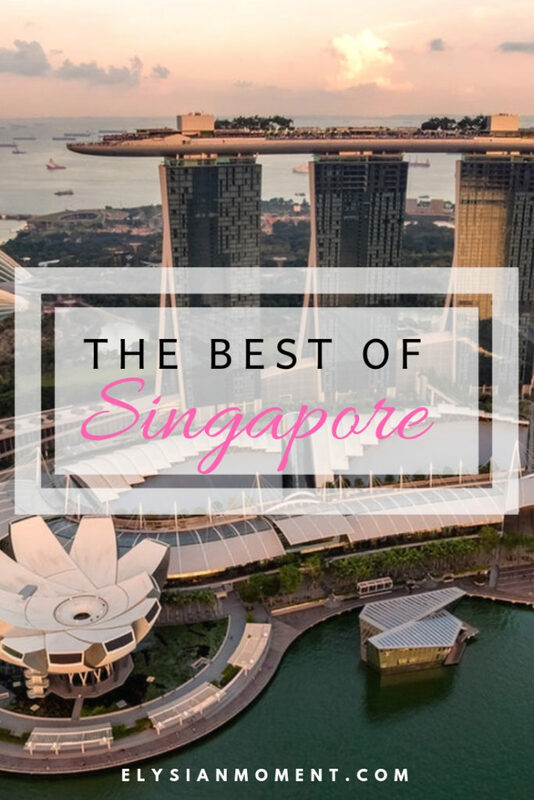 After you’ve seen the best highlights that Singapore can offer it’s time to bring something nice and memorable from this vibrant city. The best place to immerse into retail heaven is to go to Orchard Road. Begin at one of Singapore’s oldest department stores, TANGS. Afterwards make your way to ION Orchard, to Singapore’s unique shopping complex. At Far East Plaza will be the epitome for street fashion enthusiasts and bargain hunters. Orchard Road is also famous for it’s world-class international cuisine and coffee lovers. Stop by Oriole Coffee and Bar and recharge your batteries with an aromatic cup of in-house roasted coffee and tasty breakfast. If you are really hungry then don’t wait too long and drop by Wild Honey in Mandarin Gallery. This is where you can find various nations under one roof. After all this it will unfortunately be time to drive to the airport. Singapore has not only impressive architecture to offer but also an impressive dining experience. It’s doubtlessly one of the greatest culinary destinations in the world where you can taste something completely new. If you want to try authentic Eurasian and Peranakan dishes then don’t miss Folklore. Everything is made the old-fashioned way from scratch basically by one person so it might take some time but the experience is phenomenal. Where can every traveler have delicious local food for a good price? Of course in hawker centres also well-known as food courts. It’s hard to believe but street food stalls in Singapore have been awarded the coveted Michelin star. There are a few hawker centres in Singapore but the most famous ones are Chinatown Complex Food Centre, Old Airport Road Food Centre and Maxwell Road Hawker Centre. 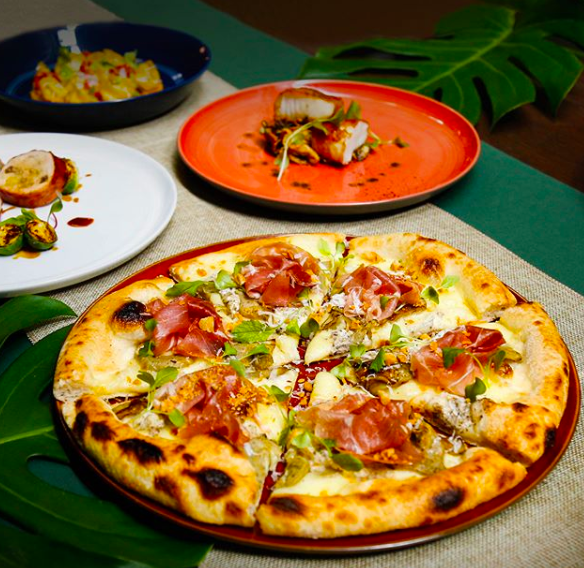 If you prefer sophisticated yet casual then try some delicious sourdough pizzas at Amò. There is even an open kitchen where every visitor can observe the pizza chef tossing dough into the air. Amò is also famous for it’s spaghetti with Boston lobster and tarragon. Might be a bit pricey but worth to taste it!